Please join me at the opening reception of my upcoming 2016 solo art exhibition – “Dividers” – at Pirate Contemporary Art Gallery in Denver, Colorado Friday July 22, 2016 from 6-10pm. My exhibition this year will feature new drawings and paintings. Please join me at the opening reception of my upcoming 2015 solo art exhibition – “Relics of Mongolia” – at Pirate Contemporary Art Gallery in Denver, Colorado Friday, July 31st, 2015 from 6-10pm. My exhibition this year will feature new paintings and installation art. 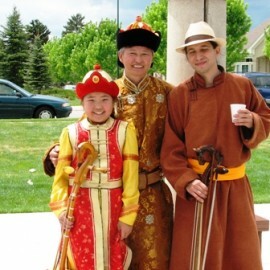 Also, thanks greatly to my show sponsor – Denver’s Bd’s Mongolian Grill! presented by: Denver’s Sister Cities International along with Denver’s Office on Cultural Affairs and Denver Parks and Recreation. 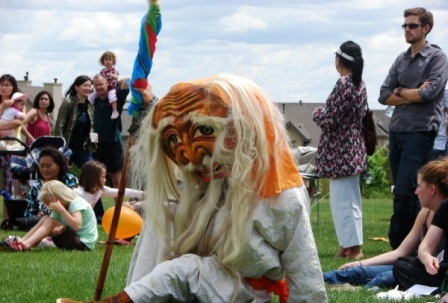 An official art dedication celebration of a Tulga Sculpture, generously donated form the Mongolian Community Association of Colorado to the Lowry community and the City and County of Denver. 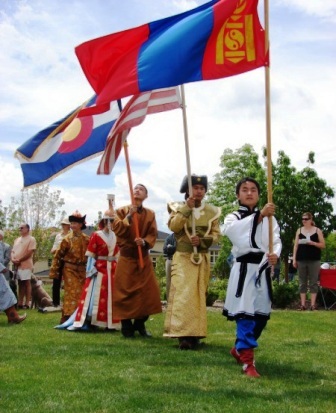 The highly anticipated dedication of the Denver based Tulga will be accompanied by a special appearance by the Mongolian Ambassador and other noted dignitaries in the Mongolian community. 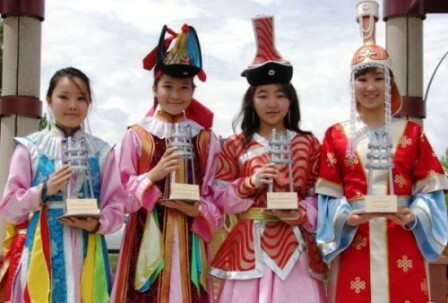 The Tulga sculpture represents a fireplace and is the most esteemed piece of Mongolian nomad household. 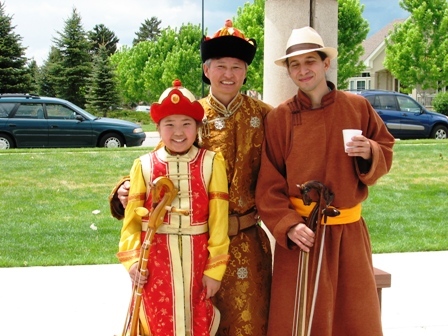 Living the Nomadic was of life was typical of the Mongolian ancestors; herding sheep, goats, cows, camels and horses. 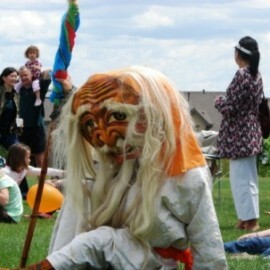 The Tulga represented the spirit of where they laid their heads down to rest. 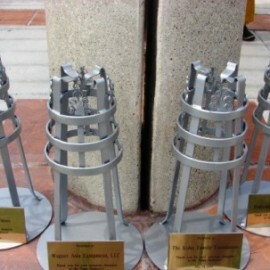 The four legs represented the 4 directions and the 3 rings represented the sun, moon and stars. 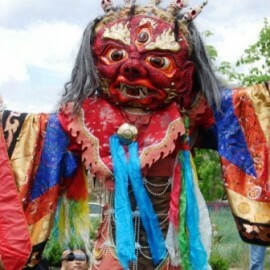 The top of the four legs are sculpted to imitate a bird’s head; legend say birds protect fire. And the base of the Tulga represents infinity and eternal bliss. 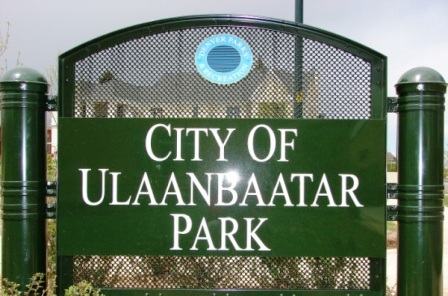 Why: Tulga sculpture is the final phase in the City of Ulaanbaatar Park. 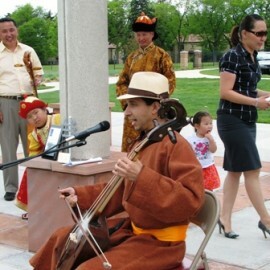 Date and Time: May 24, 2009 at 11:00 a.m.
Venue: Ulaanbaatar Park is located in the Lowry community at East 5th Avenue and Roslyn Street. 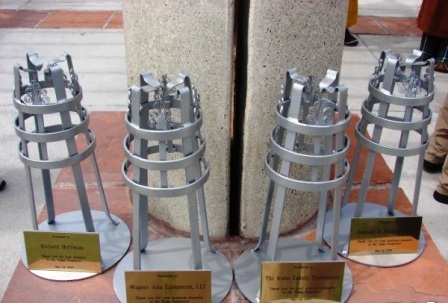 The Tulga sculpture has been one of the biggest accomplishment in my career as an artist. 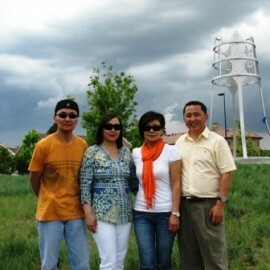 Its amazing to experience the flowering of what was once an an abstract idea to what is now built, and in its physical presence, a towering 20 foot x 7’6″ stainless steel sculpture of a stylized Tulga (Mongolian for fireplace) that stand on a hill in the City of Ulaanbaatar Park of Denver, Colorado. The sculpture project undertaking was of a grand scale to say the least, spanning five years of joint efforts, dedication and hard work. There are many people who I list below that have helped make my idea come alive, but the most important support came from my family and my fellow ‘Tulga’ group whom I genuinely thank. Seeing that the Tulga sculpture opening ceremony will be coming up on May 24th 2009, I thought it would be a tremendous idea to chronicle the history of how the sculpture came to life. 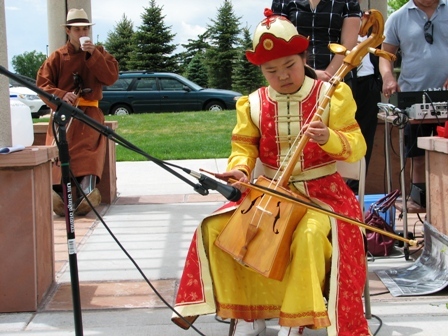 The city of Ulaanbaatar, Mongolia and Denver have been sister cities for five years in 2004. 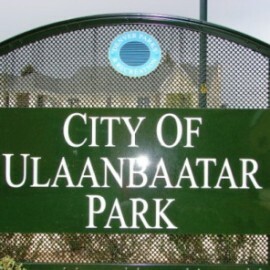 In recognition of this long held bond, the city of Denver has distilled their wonderful legacy and the Lowry district of Colorado has named their public park, “City of Ulaanbaatar Park”. 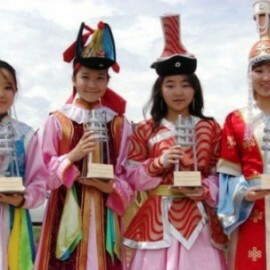 This was perfect timing as the much anticipated “800 years of Mongolia’s statehood celebration” frenzy started up in 2005. 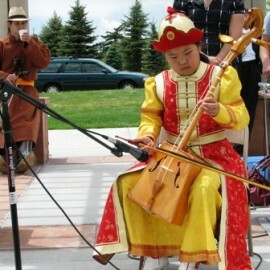 In January of that year, the Colorado Mongolian Community Association (MCAC) held an important board meeting, and being a MCAC member, I suggested an idea of creating some type of a memorabilia both in recognition of the Mongolian culture at the City of Ulaanbaatar Park and Mongolia’s 800 year statehood celebration. I received positive feedback which marked the beginning of my journey to finding the identity and form of the Mongolian “Tulga” symbol into a sculpture. 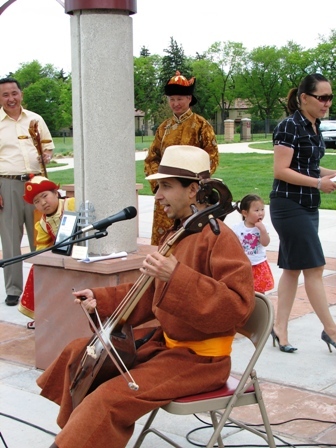 Coming up with the concept of The Tulga sculpture was an important endeavor for me being that it was the first permanent public sculpture designed and built by a Mongolian artist in America. In the Mongolian culture, the Tulga is an open fireplace representing the spirit of the most esteemed piece of the nomad household. 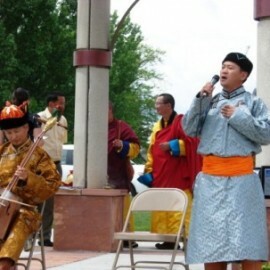 But the legacy of the Tulga spreads beyond just the project itself, establishing a rather deep rooted symbolic footing for the ethnic identity and migration of Mongolians that reside in America. 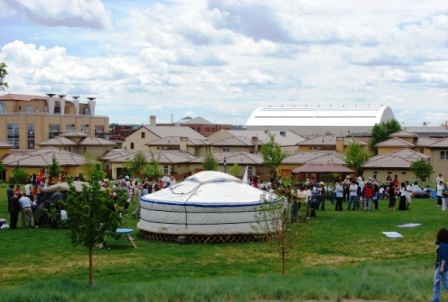 If we contrast America’s landscape as the inner structure of the mongol ger, Denver-Colorado positions at the center mimicking exactly where the Tulga (fireplace) takes place inside the traditional structure of a ger (Mongolian tent like house). 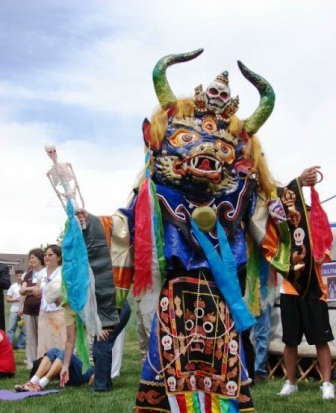 I also took into account the symbolic reference of the Tulga being located in Colorado as referencing a greater emotional importance to all Mongolians in America. Colorado signifies the first state to which the first Mongolian immigrants called home, and just as we would when we build a new ger, we center the Tulga, start the fire, give birth to and raise our children, learn, grow, and educate, work hard for a chance at a better life, and most importantly, leaving the Tulga flames sparking for future generation to keep lit. In addition to being a symbol of warmth and comfort, the Tulga Sculpture represents the spirit of the home. The three rings represent the sun, the moon, and the stars. 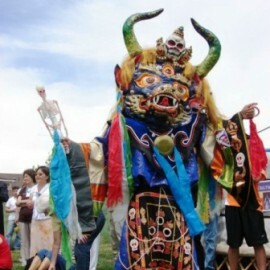 The top of the four legs are sculpted to imitate a birds head, the birds which protect the fire. For the base mount of the sculpture, I decided to incorporate/engrave the symbol of the endless knot pattern in the center of the circular base platform, which represent infinity and eternal bliss, foreboding an eternity of good omen for our children and the people who visit the park. 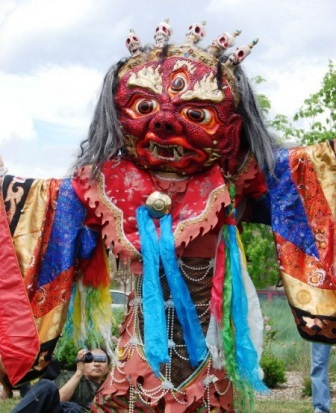 The specific positioning of the sculpture also equate the Tulga in alignment with the earth, as each of its four legs are an alignment to the four cardinal directions. 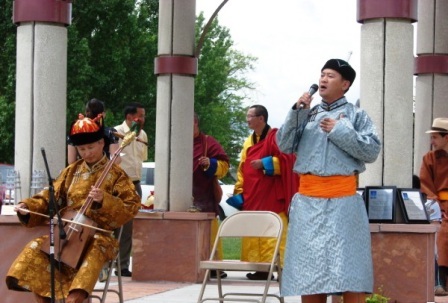 The symbolic motivation and meaning behind the Tulga sculpture was of great significance but in order to gain official approval of the sculpture proposal, I introduced my idea to the board of the Ulaanbaatar – Denver Sister Cities International and gained full support. 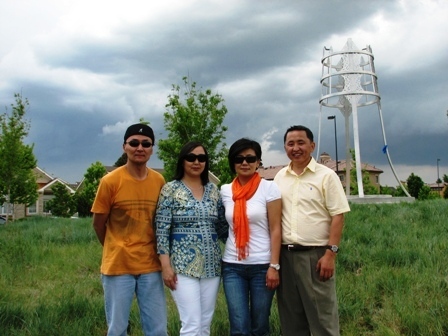 In 2006, the Colorado Mongolian Community Association granted also officially granted my proposal, and created the ‘Tulga’ group consisting of Naranzul ( 2006 MCAC president), Zolzaya (2006 MCAC vise president), and myself as the author of the sculpture. And with an equipped team, we early started the proposal initiation. 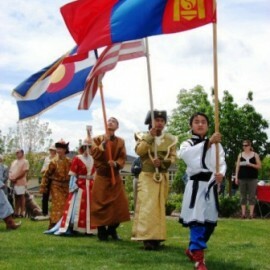 The Mongolians in Denver became the first to contribute to the project fundraising efforts, donating an estimated $2,084. In the following two years from 2007-2009, our Tulga group furiously went about the projects expansive financial undertaking; assembling paper works, vying for project approval from various official organizations of the city, receiving contracts and doing the utmost to raise funding. But even after our yearly efforts, we lacked in funds so as of May 2007, we proposed the project to members of the Mongolian Parliament. 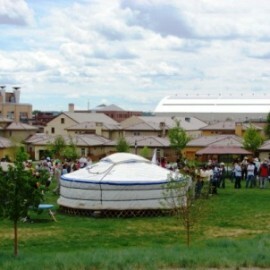 We hopes to gain support from Mongolia but in the long run, out proposal was not granted. 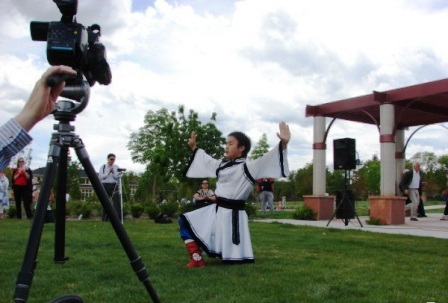 In our final funding attempts, we looked to the members of the Lowry Community with an introductory video that explained the Mongolian culture, lifestyle and traditions. We were happy to find that the Lowry community responded in great support to the project, agreeing to provide us with the remaining funds with an even further request to increase the height of the sculpture to 20 feet which was two times its original length. We happily obliged to this request. And with its new alteration, the Tulga sculpture was officially noted as a landmark achievement for its size, design, and idea as the first public art statue created by a Mongolian artist in America. 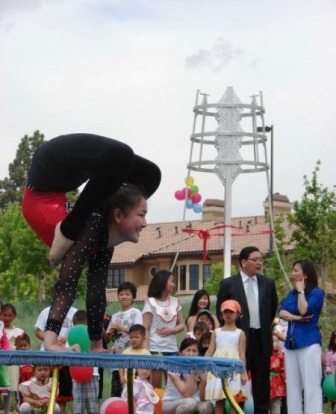 You can also go to my exhibitions page to see pictures from the Opening Ceremony on May 24 2009. 1999 - 2019 Tsogo Mijid | http://www.tsogoart.com is licensed under a Creative Commons Attribution-NonCommercial-ShareAlike 3.0 Unported License.